DAVID LE/Staff photo. 3/7/15. 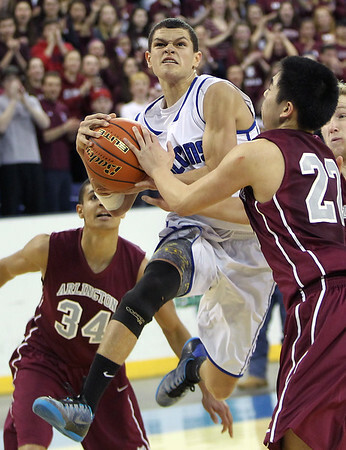 Danvers sophomore guard Devonn Allen gets fouled in midair by Arlington senior Joshua Lee (22) while he drove to basket at the end of the second half of the D2 North Championship on Saturday afternoon at the Tsongas Center in Lowell. The Falcons defeated Arlington 50-47 to capture the D2 North Championship.